Extension of detention upheld for another four Ukrainian sailors involved in border case | Russian Legal Information Agency (RAPSI). 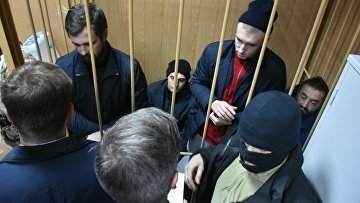 MOSCOW, February 12 (RAPSI) – The Moscow City Court on Tuesday upheld extension of detention for another four Ukrainian sailors charged with illegal crossing of Russian borders, the court’s press service told RAPSI. Therefore, Roman Mokryak, Andrey Oprysko, Yevgeny Semidotsky and Sergey Tsybizov will remain jailed until April 24. Last Thursday, the court upheld detention of Ukrainians Sergey Popov, Bogdan Golovash, Vladimir Tereshchenko and Andrey Shevchenko also involved in the case.